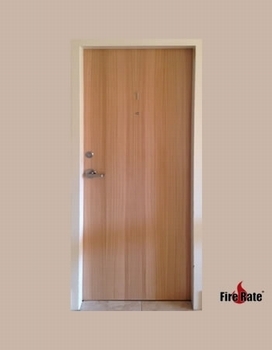 Fire Rate provide quality safe and secure fire safety door upgrades across Sydney to comply with current Australian Standards. Complete installation services including painting/staining, signage, tagging, certification and warranty. New fire door to existing rated frame or complete fire door, frame & hardware upgrades available. Remove & re-fit existing complaint hardware or customising new locks, closers and accessories to suit your buildings requirements, style and budget. Apartment entry fire doors, fire stair doors, final exit doors, tight fitting solid core doors, smoke doors, non-combustible lined service cupboard doors, steel sheeted security doors and custom veneers. Residential, commercial and industrial fire door services. 1 hr(-/60/30) to 4 hr(-/240/30) door ratings. Custom made fire door frames to suit brick, block, concrete, hebel and rated plasterboard wall systems. Cast-in and retro-fit frames/doors. Primed zinc, galvanised and polished stainless steel frame and door options. Small access doors, standard doors, large doors, standard pairs and large pairs, Fire Rate customise fire safety doors and frames. Lever locks, panic bars, closers, smoke seals, security peep holes, door numbers, threshold plates we offer the lot. Installing fire doors is precision work, that requires a licenced trades person with considerable knowledge, experience and understanding. Our expert installation team ensure quality installed fire safety doors to avoid customers dissatisfaction. We specialise in unit entry fire door replacements to match existing fire doors or carry out complete fire door, frame and hardware upgrades. Plus fire safety doors to fire stairs, external steel sheeted doors, Service cupboards, non-combustible lined doors, smoke doors, singles and pairs, for Small - Medium projects. Need professionals to install fire safety doors? 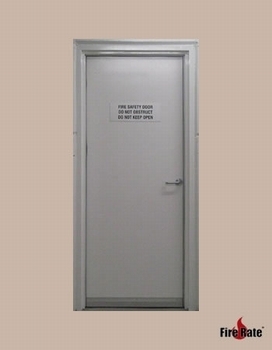 We assist fire protection companies and others that want a fast reliable fire door installation. Trade discounts, with warranty and certification. Fully insured. Guaranteed customer satisfaction. So if you are either a Fire Protection Company, Strata, Body Corporate, Owner, Building Manager, Maintenance Company, Real Estate, Handyman, Builder or Developer that wants the job done right every time, without the hassle of unhappy customers. Try the fire door trade professionals, you won’t look back! We are a growing electrical based fire protection company in Sydney. Fire Rate have been our door repair and replacement contractor for over 3 years. Nothing but good feedback from our customers. It’s been a great business move for us using their door services to expand our business. I’d just like to thank Fire Rate for all the fire doors installed at our apartment block. We were forced to get new rated doors & frames from council. We were limited with body corporate funds & Fire Rate helped us save on costs. And also helpful with council getting extensions to complete the work, when we had the funds. Thank you. Poorly hung fire doors, risk lives, property, building security and on-going maintenance costs. Our installations are done correctly the first time and every time. Save on maintenance in the future. All installations are guaranteed for twelve months – Subject to misuse or vandalism. In fact most of our doors have not needed any repairs or maintenance since installed over the company’s history. Rest assured you have made the right choice with Fire Rate®. We'll ensure maximum security, professional hanging, regulation gaps, service hinges, adjust closers & carry out a full safety check of the new fire doors & frames for long life trouble free fire doors. Fire Rate® issue a fire safety door Schedule & Fire Door Certification Certificate with every installation. Fire Rate® compliant fire door & frame tags and certificates for building & local councils records! Our unit block in Bondi required new fire doors to units, the electrical room and fire stair doors. Fire Rate were professional. The doors came out really good and the owners are all impressed. They were on time, cleaned up at the end of each day & we used our own painter who stained the doors. Very happy with the result. Fire Rate replaced my existing fire door with a sound proof fire door. They matched the timber look of other doors & the difference is wonderful. Thank you I can sleep again. Good job. Fire Rate® fire door installations offer discounts on more than one door. For example if an apartment building requires 20 new fire doors, Fire Rate® will tailor/customise your buildings requirements and discount on volume. Fire Rate® offer a huge range of tested & approved fire doors, frames, locks, closers, smoke seals, peep holes & other accessories to suit your budget & vision to attain maximum safety and security. Save property, lives and time with Fire Rate®.